Info "Wario wants to split the scene, so help him out." One In Hole is a Microgame in WarioWare: Smooth Moves. It is initially found in Wario's stage but can also be found in Tiny Wario's stage. Its name is a pun on the golf term "hole in one". The purpose of the microgame is to make people fall into a hole controlled by the player's Wii Remote. Doing so causes crops to grow. Red people jump up and down, while green ones stay put on the ground. 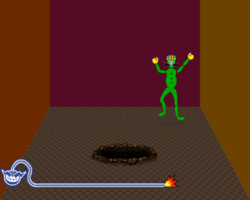 1st level difficulty: There is only one green person to trap, and he is jumping in one spot. 2nd level difficulty: There are two people, one red and one green, and they are on their initial spots for the duration of the microgame. 3rd level difficulty: There are two red people, and they move around. This page was last edited on February 18, 2018, at 19:32.